Drew and Jonathan Scott have, not one, but two, successful shows on HGTV, which seems appropriate since they are twins. They seem to do everything in twos. On Property Brothers they help people who can’t afford their dream home find a fixer upper and remodel it to include everything on their wish list. On the new series, Buying and Selling, they help current home owners renovate their homes to get top dollar when they sell it and then help them find a new home to move into. We had a chance to talk two-on-two with the Property Brothers. As always we relish the idea of chatting with other siblings that work together and these guys definitely lived up to our expectations. We asked if it was true that even their own mother can't tell their voices apart, to which Drew replied, "She can but she says Jonathan uses bigger words. That's how she can tells us apart." And so we ask your and their forgiveness if we attribute the wrong quote to the wrong brother. We did our best to keep them straight. Drew and Jonathan were born just minutes apart. Without the aid of ultrasounds and due to completely synchronized heartbeats, Jonathan was born and then little Drew was a complete surprise. They became entrepreneurs at the age of seven, at the urging of their dad, who according to Jonathan said, "Congrats, boys. You're seven. Get a job." He added, "I'm not kidding you." They started selling homemade crafts overseas in the Japanese market. They also began performing at a young age, but after high school they decided that they didn’t want to be starving artists, so they got into real estate. By the age of 18 they had bought their first property with $250 down and soon their friends were asking them for help. So Drew become a licensed realtor and Jonathan began customizing homes. As siblings working together, they say they have a healthy sibling rivalry. Jonathan commented, "Drew is one competitive dude… We're competitive in a way that really boosts each other. We don't really tear each other down. We don't try to beat, we try to encourage each other to do better, which is how we've always been since we were little kids." We asked them about the highs and lows of working with a brother and Drew joked, "The worst part is having a co-host with such nasty hair. He really needs to work on that"
Jonathan added, "Believe it or not, way back in the very beginning Drew would actually get in and he would do tiling and things like that. This is going back to 1997, our early investment, but it's nice that Drew can actually walk into a space and he knows the potential is of what I can do and that's great. The worst thing is as soon as the work starts, Boom, Drew's gone." Drew quipped, "It's not the worst for me, I'm probably on vacation somewhere, it's really great." But in all seriousness the brothers did reveal the secret to a success sibling partnership. Drew divulged, "We actually have what we call the no BS rule... We can't be BSing each other. We can't hold things back and get all upset about something. So if there's an issue we get it out on the table, we deal with it and we move on. And that's really what's always helped us." Jonathan also noted, "The other great thing we have is I'm always carrying power tools and it's just not a good idea to argue with someone with power tools." Drew and Jonathan also have third brother, JD, who helps in their endeavors. Jonathan said, "On the construction side of things, JD used to work with me as a site super and he used to get right in there doing all of the work, too. And on the production side, he works for our production company. He's a very creative person and has written a lot of the work that we've done." Yes, that's right when not filing two TV shows, the Property Brothers also have a production company. They have mainly shot corporate videos, produced independent films and staged big events, like a gala at the recent Toronto Film Festival. But in 2013 they will begin shooting a feature film. The romantic comedy will be Drew’s feature directorial debut. And as if all that weren't enough, Jonathan is an illusionist. He used to have a full-scale Vegas show complete with dancers. He stated, "Magic is the art of tricking people and I'm pretty darn good at it." Of course, he has one advantage that other illusionists can only dream of, but believe or not he has never used the oldest bit of twin magic there is. Drew remarked, "He has an identical twin and he's never used me in any of his tricks." So, contrary to popular belief the twins do lead separate lives beyond their two TV shows. Drew noted, "It's important for anybody to have individual passions. Believe it or not, a lot of people don't realize this, but twins are individuals. We have our own likes and dislikes. But the great thing is we also do share a lot of our passions and its nice to have the support of someone out there you know you can trust with whatever you're going out there for." Jonathan recounted, "Whenever I go traveling, by myself somewhere, everyone always comes up and they're like, 'Oh man, I love the show. Where's Drew?' And believe it or not we're not attached at the hip. So, yeah, sometimes we go off and we do our own thing." But Drew joked, "We actually do sleep in bunk beds still. Wherever we are we have a portable bunk bed. We bring." 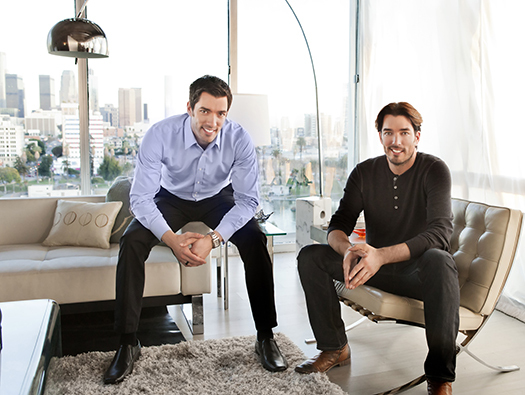 Watch Property Brothers at 8 p.m. EST/7 p.m. and Buying and Selling at 9 p.m. EST/8 p.m. every Wednesday on HGTV.